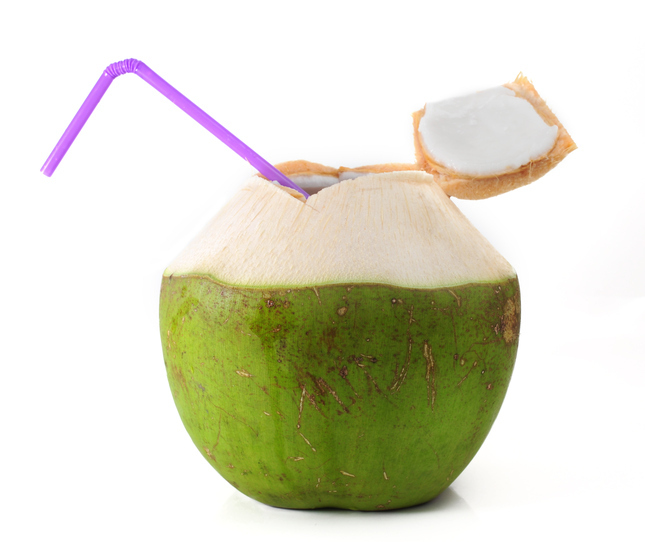 Coconut water ... overhyped and understudied? Coconut water (CW) has been among the hottest beverage trends over the past five years, and is often thought of as a healthier alternative to the more traditional sugar-laden sports drinks people consume during exercise. Though marketed primarily as a general use drink, it has gained popularity as a sports drink. This is because it naturally contains both carbohydrate and electrolytes, despite having an overall middling micronutrient content (as shown in Figure 1). Unrelated to exercise, its proponents often remark that coconut water can be prepared to be given intravenously without complications, as its osmolarity (concentration of a solution) matches that of our blood. 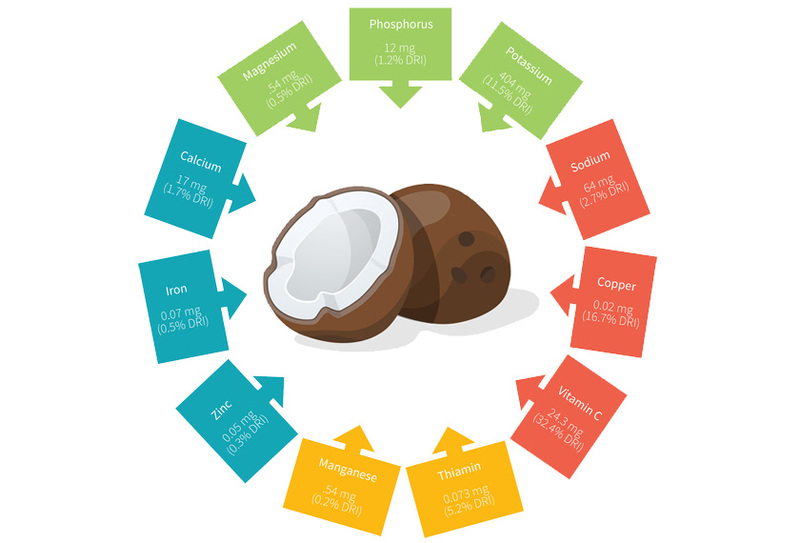 While the osmolarity of coconut water may be similar to that of human blood, that does not necessarily make it a better sports drink than those commercially available. Several studies have looked at CW as a way of improving rehydration after exercise with fairly unremarkable results. One study found CW was better than plain water at rehydrating after exercise, but not any better than commercial sports drink that contained adequate sodium. Two other studies found no significant differences in rehydration between CW and plain water. One study that looked at the effects of CW consumption prior to exercise found no differences in exercise capacity when compared to consumption of sports drinks or plain water. In contrast, other research has found that drinking CW prior to exercise did result in an improved “time to exhaustion” for cycling exercise performed in a hot environment. Findings from these studies also show that individuals consuming CW reported gastrointestinal distress more frequently. No study to date has examined CW consumed by participants during exercise, and so any performance-enhancing (or detracting) effects are unknown. Accordingly, the aim of this new study was to examine the effects of CW compared with plain water on hydration and performance. Secondary outcomes were palatability and voluntary intake of CW during intense exercise. Coconut water is often touted as a healthier sports drink, although research looking at its effects on performance, particularly when consumed during exercise, is lacking. 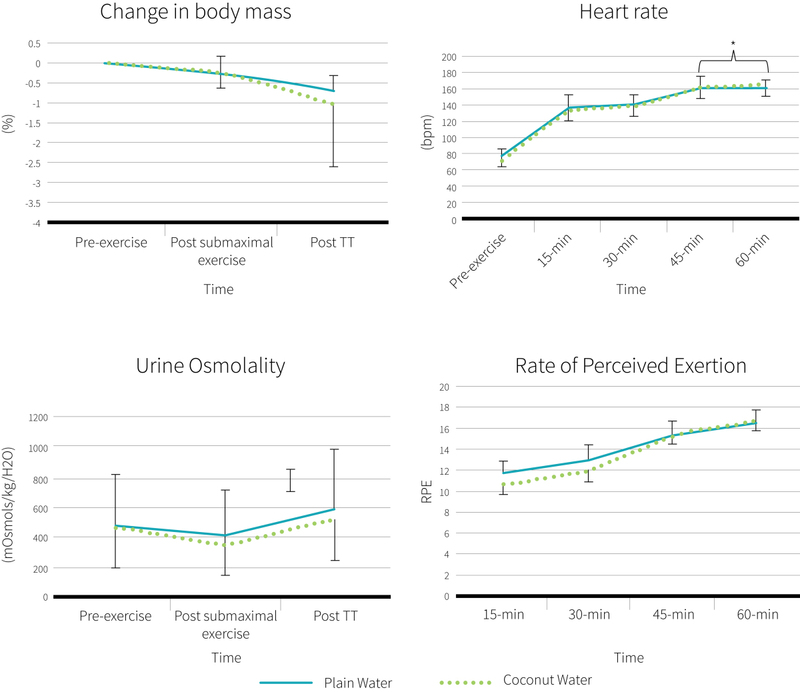 This new study was set up to examine the effects of coconut water on hydration and exercise performance. This randomized cross-over study included ten recreationally active males (average age 27.9 years, BMI was not reported), who on two separate occasions completed 60 minutes of submaximal cycling followed by a 10 kilometer time trial. Participants consumed either CW or plain water throughout the testing in a randomized order. The 60 minutes of submaximal cycling included 30 minutes at a low intensity (45% max power) and 30 minutes at a moderate intensity (65% max power). Participants were given 250 milliliters of the assigned drink between 10-15 minutes, 25-30 minutes and 40-45 minutes, and in order to study voluntary fluid intake were instructed to drink freely from 55-minutes until the end of the 10 kilometer time trial (which took approximately 16 minutes to complete). Measurements of body mass and urine osmolality were recorded pre and post-exercise as well as after 30 and 60 minutes of submaximal exercise. Rating of perceived exertion (RPE, on a 6-20 scale), heart rate, blood lactate, and blood glucose were recorded during each drink period, along with subjective ratings of thirst, sweetness, nausea, fullness and stomach upset (1 = very low/none, 5 = very high). On two occasions, ten recreationally active males completed one hour of submaximal cycling followed by a 10-kilometer time trial during which they consumed either plain water or coconut water. The main study results are shown in Figure 2. There were no significant differences between groups for time trial performance, heart rate, perceived exertion, sweat rate, urine osmolality, blood glucose, or blood lactate levels during exercise. Additionally, subjective ratings of thirst, nausea, fullness and stomach upset were similar between groups, while CW received a higher rating for sweetness. The only noteworthy difference between groups was that CW consumption was significantly lower than plain water (115 ml vs 209 ml, respectively) during the final 15 minutes of submaximal cycling and subsequent time trial. This study adds to the existing literature on CW’s use as an alternate form of hydration, and is the first to consider its use during exercise on measures of hydration and exercise performance. CW has been suggested to be better for rehydration than plain water, but this study found no evidence of such benefits. This study also showed that individuals in the CW group consumed less fluid, likely due to differences in palatability. However, just because people drank less of it doesn't mean it was necessarily less palatable. They could have also been less thirsty or felt more full or sick when drinking CW, which could have lessened intake. Sweat rates during these trials were approximately 1.3 liters per hour, which may not have been high enough to observe differences between beverage types. Additionally, the total duration of exercise was around 80 minutes, which may have been too short to see an effect of the carbohydrate content of CW. While some studies have shown beneficial effects of carbohydrate consumption on exercise durations between 60-90 minutes, this is more likely to occur with higher exercise intensities (greater than 75%) than what was used in the submaximal part of this study. The researchers also proposed that the carbohydrate intake for CW may have been too low to see a benefit, which was approximately 43 grams per hour. However, this is unlikely as other research (also covered in ERD #10) found benefits with 39 grams per hour. A review of the effects of carbohydrate supplementation on exercise performance of varying durations identified 26 studies with exercise durations less than two hours, and found on average a 2-5% performance improvement that was positively correlated with increasing exercise duration. Results of this study suggest that CW is not better than plain water for improving performance or hydration status while undergoing one hour of submaximal cycling followed by an approximately 15-minute time trial. This is the first study to look at the effects of CW ingestion during exercise, but the results are in accordance with other research showing that CW is not any better than plain water at maintaining hydration. Exercise performance was similar between trials, a finding that is in agreement with a 2012 study that had trained men complete a time-to-exhaustion trial three hours after a dehydrating exercise bout, where rehydration with CW did not offer any performance advantage compared with plain water or sports drink. It is noteworthy that this study was conducted in a moderate (room) temperature, but there may be some benefits of consuming CW when exercising in the heat, as was observed in a study with recreationally trained men cycling until exhaustion in a hot (34°C) environment. Blood glucose levels were not different among trials, which is in contrast to other research showing significant differences between water and a carbohydrate control (which was not CW, however). This may have been due to the exercise intensity, which was greater than that seen in the current study, as well as a slightly different carbohydrate intake. In contrast with several previous studies suggesting that CW is more palatable than plain water, participants in this study drank significantly less CW than plain water when given the option to drink freely in spite of similar ratings for fullness, thirst, and stomach discomfort. The authors of the current study astutely point out that studies finding favorable palatability took place in tropical regions where CW is more traditionally consumed, while the two studies where plain water was preferred were conducted in the US and UK where CW is less commonly consumed. This may indeed be more important than just a passing observation, as palatability of a drink plays a critical role in promoting fluid intake during exercise. It should also be noted that some studies use fresh CW while others (including this one) used bottled CW, with taste and palatability being potentially different between the two. Although CW wasn’t included, a recent study (covered in ERD #16) that examined how various beverages affected hydration at rest found that electrolyte content was the biggest determinant of hydration. When considering the large quantity of potassium in CW, one would expect it to have a greater hydrating effect than plain water. It is possible that a different result was seen because participants were exercising, or perhaps because of the short study duration (less than two hours). Another factor is the difference between sodium and potassium. Sodium is the major electrolyte lost in sweat, while potassium is the major electrolyte inside the cells and is not lost in appreciable amounts through sweat. Evidence for the optimal sports drink supports the use of sodium, with potassium considered an optional addition. Because of this, one cannot lump all electrolytes together when discussing their importance in sports drinks. Figure 3 lists the energy, sodium, and potassium content of some popular rehydration options. Very few studies have been done with coconut water, the majority of which have focused on its use as a rehydration beverage after exercise. This is the first study to look at its effects during exercise. Would men and women be expected to respond similarly? This is likely. As is so often the case, this study population was entirely made up of men. There is no reason to think that women would have responded differently within the context of this study design. It’s possible; however, that women could respond differently to the electrolyte beverage (CW) on different days of their hormonal cycle, due to the effects of estrogen and progesterone on plasma volume and electrolyte balance. Are there other contexts where CW may be more beneficial than plain water? Yes. According to recent NHANES data, many people short of the recommended potassium intake, and CW is a great source of potassium. This study is the first to look at the effects of CW on hydration and performance when ingested during exercise, and provides no reason to choose it over water for moderate exercise lasting less than 90 minutes. There were subjective differences between drinks for taste and a lower voluntary intake was observed for CW compared with plain water, possibly as a result of taste preferences.